On Wednesday, we’ll look forward to your takes on how Catholics – indeed, all people – should approach the subject of alcohol consumption. Some, for very good reasons, stay completely away from it. Others drink to excess, which can cause all sorts of problems. The Church teaches that we can enjoy all of God’s creations (as long as they are not morally objectionable) in moderation. St. Paul even counseled Timothy to drink some wine as partial cure for some of his illnesses. 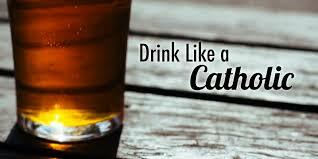 And if you look at the history of beer, it’s been Catholic monks who have led the way for centuries in the art of brewing. Get this: there’s even an International “Buy a Priest a Beer” day. Seriously – http://www.catholicgentleman.net/2014/09/good-heavens-international-buy-priest-beer-day/. So, what’s your take on drinking alcohol? Let us and the world know on Wednesday!